The media library represents a simple and clear access to various on-line available audiovisual contents of the SARRRAH®-Project. On December 29th 2014, three men were lost in Babia Gora (south east Poland). Two of them were in good condition, but one was GCS 7. Local weather conditions included very strong winds and low temperatures, about -13 degrees C.
When the Polish Mountain Rescue Service took the patient to the ambulance, cardiac arrest had started (initiation rhythm was VF and body temperature, measured in the ear, was 22 degrees C). The hypothermia coordinator maintained regular contact with the ambulance and dispatch centre, the patients were taken to John Paul II hospital, at a distance of 98 km and placed on ECMO VA. 150 minutes of CPR till ECMO veno-arterial implantation. At the final stages of the film, Wojtek, the serious patient, commented that in his situation, it was important to remember the phone number of the Polish Mountain Rescue Service: 601 100 300. He implied that this number should be recorded on the mobile phones of every mountain adventurer. Running time: 6 Minutes. Year: 2015. Production: Drkszak; Poland. Autor: Tomek Darocha; Severe Accidental Hypothermia Center; John Paul II Hospital; Collegium Medicum; Jagiellonian University Poland. Camera: Pawel Zakrzewski; Mateusz Swider. Installation: Pawel Zakrzewski. Music: Quaro - Yojimbo; Jelsonic - The Last Whale; Vienna Ditto - Ugly; Veena Kinhal - Haratanaya Sree (freemusicarchive.com). Source: hipothermia.edu.pl. 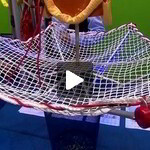 One of the highlights of this year's SMM (shipbuilding machinery and marine technology international trade fair) in Hamburg, the world's leading maritime economy, was the presentation and practical demonstration of the RLS - RescueStar. Naturally the MOB rescue most often takes place in bad weather conditions and sea state, so any use of rescue boats itself means a high risk to life and safety to the boat crew. Salvage in vertical body position generally bears the danger of a so called "rescue-collapse" – finally to the death of the rescued person. These problems are now considered by MSC 1 / Circ. 1447 § 2! The RLS - RescueStar a maritime salvage system meets all technical and medical needs and requirements of a safe recovery! Running time: 4 Minutes. Year: 2014. Production: Zag!media GmbH Hamburg. Autor: Andrea Reichmuth-Vedder. Camera: Arne Ross. Source: smm-hamburg.com. 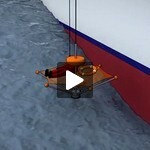 The report shows the simple and practical functioning of the rescue system RLS - Rescue Star means of animations. 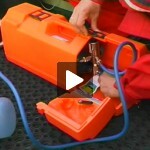 More than six years of research and development have the RLS - Star Rescue made ​​to an efficient recovery tool. Crew and ship's officers do not require lengthy training; is the simple principle, once understood, no additional training is needed. Particularly for ships with low manning levels, it is very important that all crew members remain on board during the rescue operation in heavy seas. Preferably on-board cranes and lifting devices can be used for the introduction and removal; hence the need for costly retrofits. Running time: 2 Minutes. Year: 2014. Production: Tedimex GmbH. Expert Advise: Dr. Wolfgang Baumeier; Prof. Michael Schwindt. Realisation and organisation: Gitschel HPA GmbH. Animation: York Buschmann. Actors: SARRRAH®-Projekt. Source: tedimex.de. The report shows the rescue appliance RLS - Rescue Star in a practical emergency exercise on the pilot boat Explorer of Abeking & Rasmussen Schiffs- und Yachtwerft GmbH & Co. KG., Bremen. The rescue appliance RLS - Rescue Star is a particularly suitable equipment for the rescue at sea (Rule 17-1, Chapter 3, International Convention for the Safety of Life at Sea (SOLAS)). 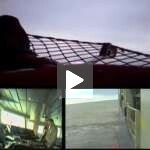 After only a minute the person is rescued by the RLS - Rescue Star with only one man and without self-endangerment operated, recovered back on board in a horizontal position to prevent the rescue collapse. Running time: 4 minutes. Year: 2013. Production: Ship Safety Division BG Verkehr. Expert Advise: Kapt. Peer Lange; Prof. Michael Schwindt. Actors: Abeking & Rasmussen Schiffs- und Yachtwerft GmbH & Co. KG. Source: deutsche-flagge.de. Among the features of the Recovery Systems 2007 it concerns a continuation of film series started in 2006. 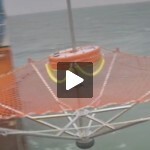 Demonstration of a newly developed rescue appliance RLS – Rescue Star for the rescue of persons from the water, intended for professional use on container ships and passenger vessels and presents the mode of operation and the use of new prototypes to rescue persons from the water including in heavy seas and on ships with high freeboards safely and efficiently. The DVD is intended for training purposes as well. There are several didactic items included. 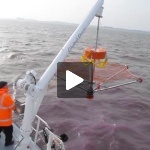 In this report physiological and medical basics are explained, as well as demonstrated testing and development steps in the large wave channel of the Forschungszentrum Küste (FZK), Hannover and at sea. Running time: 13 minutes. Production: Ship Safety Division BG Verkehr. Expert advice: Dr. Wolfgang Baumeier; Prof. Michael Schwindt; Kapt. Peer Lange. Realisation: Christian Börner - Westfälisches Filmkontor. Actors: Coworker of the Department of Anesthesiology and Intensive Care University Medical Center Schleswig-Holstein (UKSH) Lübeck; German Federal Police. This DVD is the next instalment of a series started in 2006. Demonstration of a newly developed rescue appliance RLS - Rescue Star for the rescue of persons from the water, intended for professional use on container ships and passenger vessels. 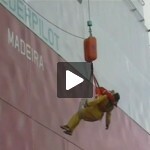 The video shows a man over board mock rescue on an 8.000 TEU-class container ship west of the Bay of Biscay in heavy seas. Running time: 17 minutes. Production: Ship Safety Division BG Verkehr. Expert advice: Kapt. Peer Lange; Prof. Michael Schwindt. Realisation: Christian Börner - Westfälisches Filmkontor. Actors: Reederei NSB; German Federal Police; Nautilus Marine; SARRRAH®-Project. 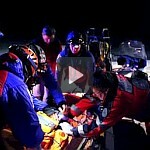 Emergency medical treatment for hypothermia that must be administered to persons succesfully rescued from the water is demonstrated in sound, vision and subtitels. This treatment is imperative to sustain the chain of rescue. Running time: 11 minutes. Production: Ship Safety Division BG Verkehr. Director and expert advice: Dr. Wolfgang Baumeier; SARRRAH®-Project; Department of Anesthesiology and Intensive Care University Medical Center Schleswig-Holstein (UKSH) Lübeck. Actor: Coworker of the Anaesthesia UKSH Lübeck and German Federal Police. With the reports of the film series first aid at sea it acts around educational films on the subject in order to rescue and resuscitation at sea. Running time: 10 minutes. Year: 2002. Production: Andreas Wulf. Director and expert advice: Dr. Wolfgang Baumeier; SARRRAH®-Project; Department of Anesthesiology and Intensive Care University Medical Center Schleswig-Holstein (UKSH) Lübeck. Actor: Tom Koethe; German Maritime Search and Rescue Service. Presentation of the RLS - double strop - a revovery device already approved as personal protective equipment. Running time: 3 minutes. Production: Ship Safety Division BG Verkehr. Expert advice: Dr. Wolfgang Baumeier; Prof. Michael Schwindt; Kapt. Peer Lange. Realisation: Christian Börner - Westfälisches Filmkontor. Actors: Coworker of the Department of Anesthesiology and Intensive Care University Medical Center Schleswig-Holstein (UKSH) Lübeck; German Federal Police.